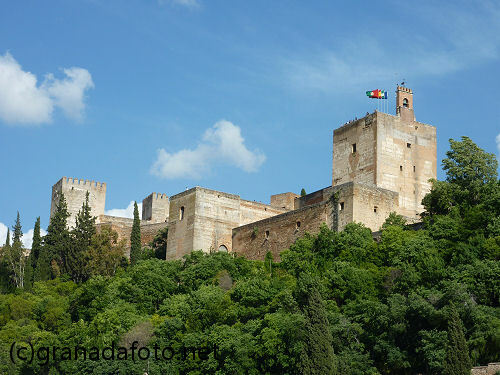 The Torre de la Vela is the tower on the left of the photo with its flags and bell tower and is the tower which dominates both Granada and the Alhambra. The tower itself was built in the 13th century during the Nasrid dynasty and the bell has always played an important role in daily Granadinian life. When Boabdil surrendered, the Royal standards of the Catholic Monarchs were raised from the tower. 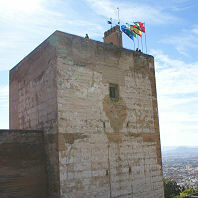 Nowadays, four flags are flown from the tower: the blue European flag, the green and white Andalucian flag, the red and yellow Spanish flag and the red and green Granada flag. The bell has been replaced several times over the years and the current one dates back to 1773. The bell tower was originally positioned in the corner of the tower but was moved to its current position in 1840 and then rebuilt in 1882 after it had been struck by lightning. Until recently the tolls were used by farmers to mark the changes in irrigation turns. It is also rung every year on 2nd January in commemoration of the Taking of Granada. Traditionally, single girls would climb the bell tower and ring the bell and it was said that if they did, then they would be married before the year was out. These days, anyone can ring the bell and the bell rings non-stop all day. During the time of the Catholic Monarchs, the bellringers were appointed by the military governor. They would normally be soldiers who had been injured in combat and they would live in the bell tower itself. The last person to live there was Encarnación "La Velera", who was the widow of the last bell ringer.